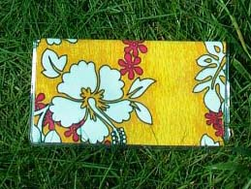 Great looking Hawaiian print fabric checkbook covers in a clear vinyl case. The vinyl checkbook case is made in USA from crystal clear .011 gauge soft vinyl. They have two natural mat non-glare or clear pockets inside. One pocket approximately 3" high has a duplicate check flap and the other pocket approximately 2 7/8" high has a bookmark flap to mark your check register page. The very soft clear material outside give the cover a rich expensive feeling while adding longevity to the flex area and to also protect the cover from cracks on cold days. You won't find these features on most checkbook covers. These checkbook covers in the open position measure approximately 6 1/4" X 6 3/4". Closed and folded they measure 6 1/4" X 3 3/8". The checkbook cover print you receive may vary from what you see in these pictures as it depends on the location of the fabric roll print the cover is cut out from. Comes with a bonus surprise print on the inside.